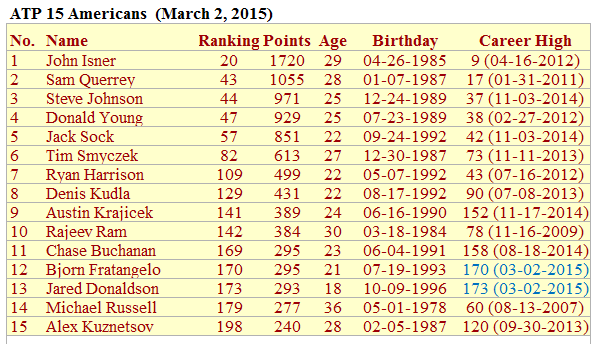 Previous Rankings: None (Skipped April, was busy). John Isner is back inside the Top 20 with a much needed semifinal run at the Miami Masters and R16 in Monte Carlo. Congrats to your new American No.2, Jack Sock, on his maiden ATP in Houston. Also in April, Rajeev Ram won the $100K Guadalajara Challenger (defeated 1st time finalist and University of Michigan alumni Jason Jung) to become the MVP in Racket Rally during that title clinching week...thanks Raj for the court coins. Prior to the breakthrough in Mexico, Jung won the $15K Little Rock futures the previous week and is currently at a career high of ATP 194. Bjorn Fratangelo continued his good form, reaching SF and QF of Savannah and Tallahassee challengers respectively. Jared Donaldson also had a good start to the clay season, reaching QF of Sarasota and Savannah, as well as reaching the SF of Tallahassee. Congrats to former Cal Poly Mustang, Andre Dome, on his maiden title at the Thailand F2. 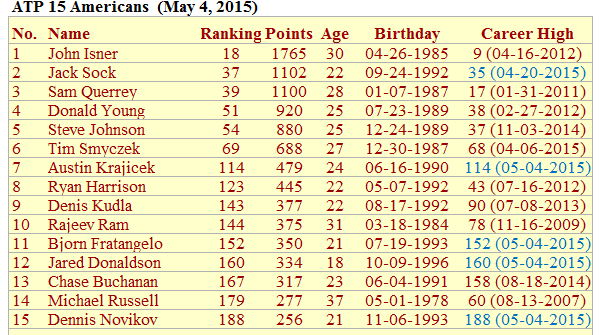 Dennis Novikov broke into the top 200 for the first time after winning his 6th futures title in Calabasas, CA. What a breakthrough for 17yo Frances Tiafoe in the last two months. The recently turned pro, who signed with Jay Z's Roc Nation, won his maiden futures title at the USA F10, followed by another Final showing at USA F11. Few weeks later, the teen qualified for his first challenger in Sarasota before falling in the QF. 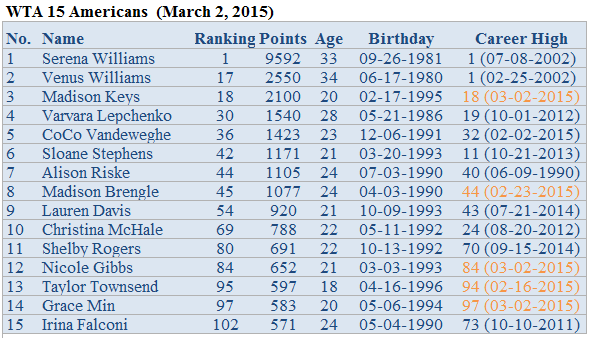 Also reached the SF of Savannah and Final of Tallahassee challengers where he cliched the USTA French Open wildcard! 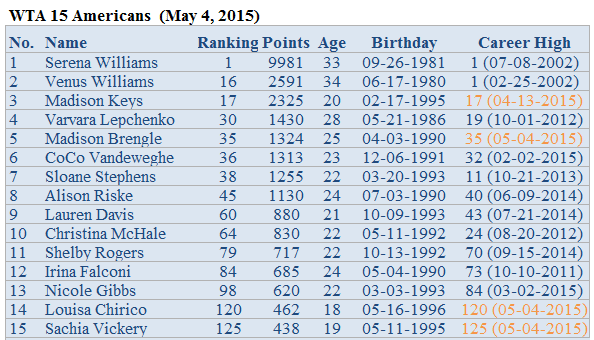 With his recent success, Tiafoe shot up the ranking and is now the 5th ranked player on the Under 21 list! Another youngster who made his first challenger QF is Mitchell Krueger. The Texan reached that milestone in Savannah and Tallahassee. Shoutout to Tommy Paul on winning his first challenger match in Savannah. The 17yo qualified and upset ATP 101 Ruben Bemelmans of Belgium. Deiton Baughman fell off the list, but with his Final showing in Nigeria F1 and with a few more results in Africa he could be back on it next month. Congrats to Reilly Opelka on turning pro and signing with Lagardere Unlimited Agency. Serena Williams continued to cement her supremacy in the WTA. The World No.1 reached SF of Indian Wells before giving a walkover and later won the Miami Open for the 8th time. Also in Miami,Venus Williams and Sloane Stephens made the QF. Madison Keys had a surprise run on clay (Har-Tru) at the Charleston Premier. The 20yo lost a 3-set thriller to German Angelique Kerber in the final. Another Madison also kept her good form rolling into the clay season. Brengle reached the final of the $50K Osprey and reached her maiden Premier SF in Stuttgart, Germany. The results propelled her into the Top 40 for the first time. Sachia Vickery scored her first Premier win in Indian Wells, taking down Alla Kudryavtseva (RUS). Later qualified for WTA Bogota before falling in round of 16. Louisa Chirico won her first $50K title in Dothan, AL, defeating fellow teen Katerina Stewart in the final. A week later, Stewart fell in another $50K final, this time to 19yo Allie Kiick in Charlottesville, VA. However, the the 17yo is in the lead of the USTA Har-Tru Wildcard Challenge with 96 points followed by Chirico and Kiick with 81 points each. The player with the most combined WTA ranking points from two events in three qualified tournaments gets the French Open main draw WC. The race concludes in Indian Harbour Beach this week. Alexa Glatch won $25K Irapuato and $50K Osprey keeping her comeback momentum going and is now back inside the Top 200. 16 year old CiCi Bellis avenged her USO loss to Zarina Diyas before falling to Serena in the third round of the Miami Open. 14 year old Claire Liu became the youngest USTA Pro Circuit Champion since Anna Kournikova in 1996 after capturing the $10K Orlando in Florida. Few weeks later, the Californian went on to become one of the youngest winners of ITF Easter Bowl. Let me know if there are mistakes or if I'm missing something.